Trying German beers is part of the fun of traveling in Germany. But we're not going to argue with anyone. We'll just enjoy local beer where ever we are. And if you're enjoying a trip to Germany you might as well enjoy a German brew. Germans do like their beers. All the companies advertise heavily... and the cafes and bars too. 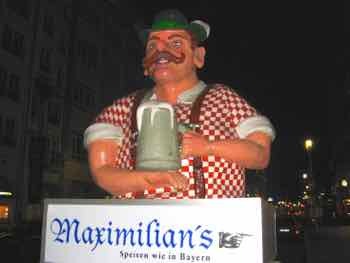 Walking down the street in Berlin, we got a kick out of this giant drinker attached to the top of a car. He's so cute he makes you want to drop in for a stein. Is It A Health Drink? According to the Discover Munich website, beer is so special to Bavarians, that it isn't even classified as alcohol, it's a "health drink". Well, I don't know about that, but we've read surveys that say it is Germans' favorite drink. So maybe it IS a health drink. 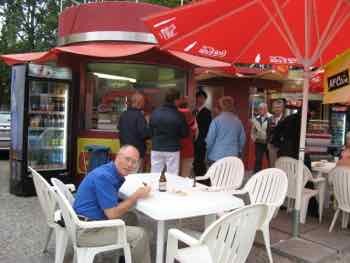 And you can try them anywhere from upscale cafes and bars to beer halls to food stands on the street! There are many different German beers to try... light beers and dark beers, wheat beers and bock beers, pilsners and ales. Some bock beers can have up to 16 percent alcohol! The brewers must adhere to something called "Reinheitsgebot". This is a "purity order" that dates from 1516. They must use only water, hops and barley malt when they are making their beer. The law has been updated. Yeast can also be used now... it hadn't been discovered in 1516! Sometimes sugar can be used too. But for German brewers, no preservatives or chemicals of any kind are allowed. No wonder German beers are so good. Beers vary by region too. But what we've read is that beers become "maltier" as you travel towards the south and conversely, they become "hoppier" as you head north. Does any of that matter? It might to you. Bavaria - So Many To Choose From! But let's just say that if you're traveling in Bavaria, you're in for a treat. Of Germany's 1,300 or so breweries, the highest concentration is in Bavaria. And they have the greatest variety of beer styles. You can spend several lunches and dinners exploring the beer halls of Munich. Surely you've heard of the Hofbrauhaus. The other biggies are Lowenbrau, Augustinerbrau, Paulaner, Hacker-Pschorr, and Spaten. 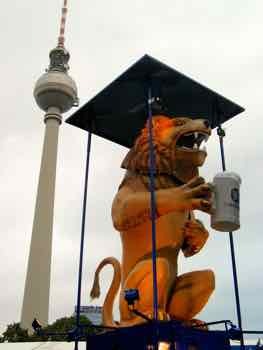 This Lowenbrau Lion made it all the way to Berlin. He graced the front of a temporary tent for Octoberfest in the north so to speak. And of course, there is always the Oktoberfest in Munich! By the way, for American readers, "light" beer or "helles beer" means only that it's light in color. It doesn't refer to the calories or the alcohol in it. There are beers that are lower in calories and alcohol... they are "leicht" beers, not "helles" beers. You should always beware of drinking and driving. The legal limit for blood alcohol in Germany is .05 grams of alcohol per liter of blood. You can be forced to submit to a blood test... so save enjoying those beers for days when you won't be driving or for the evenings once you're settled into your hotel. Prost... here's to German Beer!